This book explodes the myth of a classless society. It reveals class divisions as deeply entrenched as at any time since the Second World War. Rooted in a system of educational apartheid, and exacerbated by a pay explosion for private sector professionals and by the collapse of manufacturing employment for the old working class, the separation is widening, not narrowing. It is the most obvious and alarming social reality today. In this incisive and highly readable account, Andrew Adonis and Stephen Pollard reveal Britain’s new class structure. They make no claim for a static society, but how remorseless changes to the pattern of work, wealth and education have transformed the traditional working, middle and upper classes. Pre-existing divisions within them – between employed and unemployed, skilled and manual, clerical and professional – have widened, and new class divisions have been grafted on to them, the most noticeable consequences being the rise of the (misnamed) Underclass and of a new Super Class of top private sector managers and professionals. 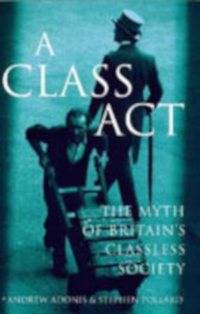 Opening with the telling efforts o political and pundits to conjure up a Middle England embracing everyone from the hospital cleaner to the City lawyer, the authors systematically examine the pillars of the new class structure. Education, health, politics, housing, race, and the professions all feature. Many leading cultural outlets, from the BBC to fashion, sport, religion and advertising, are explored. And so is the National Lottery, the most important social institution created in Britain since the National Health Service, giving a brilliant snapshot of the balance of social classes in the mid-1990’s. The Establishment is a significant part of the tale, too: the recent development of the public schools and Oxbridge, the monarchy and the House of Lords, the Conservative party and the armed forces, is a fascinating story of survival through adaptation. This book is a must for anyone who wants to understand modern Britain. First published by Hamish Hamilton (Penguin Random House, UK) in 1997.